Lexington Christian Academy (Lexington, MA) student was chosen from a pool of 1.6 million candidates who sat for the Preliminary SAT (PSAT) during their Junior years. It is a huge honor that I never expected, but I'm so glad that my hard work paid off. Christine Metzger, the interim Head of School at Lexington Christian Academy (Lexington, MA), announced today that Jennifer Murphy (’18) of Woburn, MA has been selected as a semifinalist for a prestigious National Merit Scholarship. Murphy was chosen from a pool of 1.6 million candidates who sat for the Preliminary SAT (PSAT) during their Junior years. Only 16,000 students nationwide, around 1% of contenders, were chosen as semifinalists. The number of semifinalists in each state is proportional to the state’s percentage of all graduating seniors in the United States. To qualify as finalists, semifinalists are required to complete a thorough application and provide the selection committee with academic records and information on their extracurricular activities, leadership roles and awards received. They must also score similarly highly on the SAT, write an application essay, and be recommended by a school official. 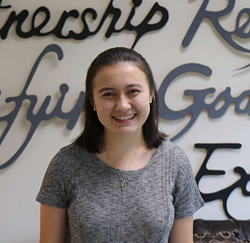 “We are so proud of Jennifer's accomplishments, most recently as a National Merit Society semifinalist,” said Interim Head of School Christine Metzger. “Her selection reflects the outstanding education that LCA provides to all of its students, as well as the hard work and leadership that Jennifer has exhibited throughout her years here. We will be rooting for her to make it all the way to the finals!" Murphy has been hard at work preparing her application to be considered as a finalist. "I am so excited to have made it to the semifinals!” said Murphy. “It is a huge honor that I never expected, but I'm so glad that my hard work paid off." Roughly 15,000 semifinalists will go on to be chosen this coming February as finalists for National Merit scholarships. Beginning in April and concluding in July, some 7,500 winners will be announced and will receive National Merit college scholarships totaling around $32 million. Lexington Christian Academy is an independent college preparatory school that exists to educate young men and women in the arts and sciences in the context of a complete commitment to the gospel of Jesus Christ.